Then you’re far more sensitive than most. Ever hear of Highly Sensitive Persons (HSPs)? Well, you’re more sensitive than 3 out of 4 of them. You’re a Highly, Highly Sensitive Person. Only maybe you’ve noticed a downside, like how so much sensitivity can make you vulnerable. What can you do about that? Try toughening yourself up? Can’t work! You are who you are. They don’t exist. So who fears vampires? Maybe empaths whose fears have run amok. Definitely empaths who aren’t yet using their power. Really, we empaths need to develop strength to support our magnificent sensitivity. Discover how powerful you can become. Downright EMPOWERED! This quick & easy book will fast-track you to develop the strength that every empath deserves. You’ll learn in detail what it really means being an empath. For instance, has anybody ever told you that empaths “feel other people’s feelings”? Not necessarily! In this book you’ll learn how empaths come in 15 varieties, not just one. Find out what you’ve really got. Honestly, how can an empath gain powerful skills without that essential self-knowledge? Also distinctive about Rose Rosetree’s system of Empath Empowerment®…. You’ll learn how to use your consciousness — your built-in spiritual awareness — to become a skilled empath. This how-to stands as Book 2 in Rosetree’s empath series. Although you might prefer to start here. You see, her Book 1, “Empath Empowerment in 30 Days,” uses a human-based approach, and it takes 30 days. While this book introduces you to a consciousness-based approach, advanced knowledge that you can learn even faster. Discover this book’s unique gift to you. Explore how to gently use spiritual awareness to become a Skilled Empath. Unskilled Empaths are less effective than other people. But we Skilled Empaths? We’re more effective. Live that beautiful strength in your own terms. Start today, becoming an empowered empath — quick & easy. A new start as an empath — that’s what you gain in Book 2 of Rose Rosetree’s sequence of books for Empath Empowerment®. This self-help book will give you unique skills. For real results. Book #2 in this series by Rose delivers an effortless but powerful set of new skills to change how you position your consciousness. Like setting a new default, which can make a subtle change to how you spend all your waking hours. As in, becoming more alive within your own life. Does this sound abstract? Well it may sound abstract right now. But Rose is an award-winning teacher with a knack for making consciousness skills super-easy to learn. Just go step by step… and you’ll win the benefits. What Qualifies Rose To Be Your Empath Coach? Let your consumer learning continue! Already you probably know this: If you’re an empath, you have one or more gifts for directly experiencing what it’s like to be another person. We empaths are hardly rare. Although empaths are special, we’re hardly rare. We amount to 1 in 20 people. Well, have you ever thought of that statistic from a commercial perspective? Today, you and other empaths are considered to be a large “market.” So it’s not surprising that many “experts” have gotten onto the Empath Experts Bandwagon. To understand more about what makes Rose’s approach unique, let’s go point by point into her background as an Enlightenment Coach. Rose’s method was developed by an expert at energetic literacy. That makes her unique among empath experts, who tend to be stuck at Stage 1 Energetic Literacy. Which limits their perspective compared to Rosetree. Since she has spent more than 10,000 hours developing 21 Stages of Energetic Literacy. This helps her to deliver more precision. Making her able to research the effectiveness of everything that she teaches for Empath Empowerment. #2. Where Are These Empath Skills Sourced? That’s right, where does the knowledge come from? The Founder of Rosetree Energy Spirituality (RES) has honed skills for co-creating with Divine help. By contrast, you may be surprised by what you learn about other empath experts. Which could be a problem now, in The Age of Awakening. Because today, if a teacher doesn’t come out and say “I co-created this with God,” guess what? That person is probably taking orders from spirits of one kind of another. Which is definitely not the same thing as God. Other experts proudly proclaim that they are psychics. Unfortunately, they may even claim that all empaths are psychics. Which is ridiculous. Rose Rosetree, for instance, isn’t a psychic. What does it mean, technically, to be a psychic? Work is sourced from astral-level spirits. Perhaps extra-fancy spirits from “more advanced” worlds. Possibly channeled beings. Not a single one of these discarnate beings is human. Does that make their knowledge “superior” for helping humans like you and me? Not really. For instance, you won’t find a single practicing psychic on Rose’s Enlightenment Life List. That’s her ongoing research project into authentically high states of consciousness. At that list, you’ll find people from just about all walks of life. But not a single psychics, channelers, or mediums. Is that just a coincidence? Maybe not. What about psychotherapists and psychiatrists? Empaths don’t necessarily have mental health problems. They have problems due to being unskilled empaths! Problems related to positioning of their consciousness. Of course, mental health experts try to figure out empath skills psychologically, by analyzing human behavior scientifically. Some therapists add skills of energy medicine or energy psychology — energy-based skills. Either way, none of these skills are sourced with help at Divine vibrational frequencies. With all respect, mental health experts may not be well qualified to help people to position their consciousness in ways that help empaths. How did this empath expert arrive at ideas that are supposed to help you? Asking that is just common sense, when you think about it. “Thanks for asking! At every step of writing this book (or any of my books), I depended on clean, clear skills for co-creating with God. “Also, I benefited from decades of study and work that primarily involved consciousness. Underlying “The Empowered Empath — Quick & Easy” are the author’s expertise concerning consciousness. How empaths have abilities and habits with consciousness that differ from non-empaths. And what empaths can do to position consciousness more effectively. Rose’s background includes working from 1971-1985 as a teacher of Transcendental Meditation. Spending over a year of her life studying at the feet of Maharishi Mahesh Yogi. Rose asked him questions, receiving nuanced answers. Not only did Maharishi teach powerful techniques for exploring consciousness. He taught Rose how to communicate about consciousness in practical terms. Pioneering, with one other colleague, the first TM-related course in an American public high school — in Miami Florida. Pioneering, with a different colleague, the first teaching of federally funded TM course for employees of a federal agency — the Illinois EPA. Fast forward to now, and The Age of Awakening. Rose can help you through a book that seems “Quick & Easy.” But, underlying it all, this Empath Coach draws upon highly sophisticated experiences and knowledge. Concerning consciousness! 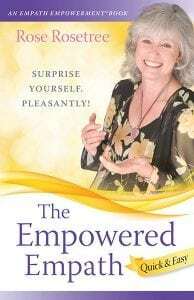 Back in the day, Rose published the first book for empaths in America, “Empowered by Empathy.” Ever since, she has continued to set the standard for coaching empaths. To an aura reader with strong energetic literacy skills, it’s quite clear that empaths have a qualitative difference to their auras. In “The Empowered Empath — Quick & Easy” you’ll learn detailed information about 15 distinctive gifts that you might have. Yet all empaths are similar in how their consciousness works differently from non-empaths. How to use consciousness to prevent both types of unskilled empath merge. How to remove the “Imported STUFF” that results from unskilled empath merge. A highly evolutionary technique for spiritual growth that also accelerates that habit of Empath Gifts OFF. This how-to book is about 1/3 as long as the Expanded Edition that you can read about elsewhere at this website. Why did Rose publish both books? Further, why does Rose strongly recommend that you read “The Empowered Empath — Quick & Easy” as Book 2 in her series to help you? And why did she create a separate “Expanded Edition” that counts as Book 3 in this series? When you’re learning something really, truly, extremely different from anything you’ve ever done before… what’s the best way to learn it? In stages. So “The Empowered Empath — Quick & Easy” brings you the basics. Emphasizing what do to when. Supplying the simplest explanations possible. Going through that book will change you: Start bringing you results. Because you’re gradually developing a new kind of expertise about positioning your consciousness. Because of your direct experiences with Book #2, you’ll be ready to bring in a whole new level of skill and understanding. Back in elementary school (a.k.a. “primary school”) you studied the history of your country. Brand new concepts. Important to learn as fully as you were capable of doing at the time. Later, in high school or college, you may have gone back over the topic of your nation’s history. As a result of earlier learning, essential concepts had settled in. You had developed as a learner. And, therefore, you were now ready to learn more sophisticated (and fascinating) material. Likewise, Book #2 plays a starter role. You learn essentials. And maybe that’s all you’ll want. But if you have your heart set on a fuller understanding, please don’t cheat yourself. Don’t skip over to Book #3. This isn’t for “smarter people.” It’s for smart people who did themselves the favor of reading Book #2. And, BTW, Book #2 isn’t the same as Book #3, “except that Rose took out all the padding.” Rose never insults her readers by padding any book or any workshop. Period. When she took the controversial step of publishing both Book #2 and then the follow-up, Book #3, she did this as the most experienced empath coach you’re likely to find. Look, empaths can be impatient. Even though empath skills aren’t just a fad or some cute little hobby. According to Empath Coach Rose, this is a life-transforming skill set that can improve your quality of life. For the rest of your life. And, therefore, worth spending some time to learn properly. Still, Rose knows that not everybody agrees. Specifically, she remembers one of her book tours in Los Angeles, California. Where she was offering a Level 1 Workshop on Empath Empowerment. And then, for graduates, a Level 2 Workshop. Now, when buying Rose’s books for empaths, of course you can choose to start with Book #3. Or even Book #4. But if you trust Empath Coach Rose Rosetree to help you, doesn’t it make sense to listen to her recommendations? Start with Book #1. “Become The Most Important Person in the Room.” Which might be enough to bring you very workable Empath Empowerment. If you want more, go through Book #2. “The Empowered Empath — Quick & Easy.” And those bigger results might be enough to satisfy you. But are your empath skills starting to thrill you? Make you even more curious? Then you’re ready to read Rose’s Book #3. The Empowered Empath: Owning, Embracing and Managing Your Special Gifts.” Another giant step forward for you, both emotionally and spiritually.